A fire broke out at a church in Warwick, Rhode Island. 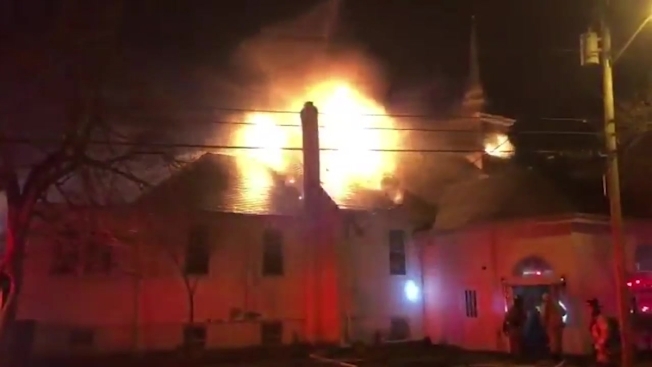 A fast-moving fire has destroyed a Rhode Island church. Acting Warwick fire chief Marcel Fonteneault says the Wednesday night blaze gutted the Woodbury Union Church, and the building has been declared a total loss. The Providence Journal says pastor T.J. DeMarco has vowed to keep the Presbyterian congregation of 100 people going despite the sudden lack of a meeting place. Fonteneault says the fire began outside and moved to the interior of the church, eventually engulfing the steeple. Firefighters from Warwick and neighboring Cranston and Providence responded. Warwick Mayor Joseph Solomon says no one was inside the church at the time and there were no injuries. Officials say the cause is still under investigation but arson is not suspected.